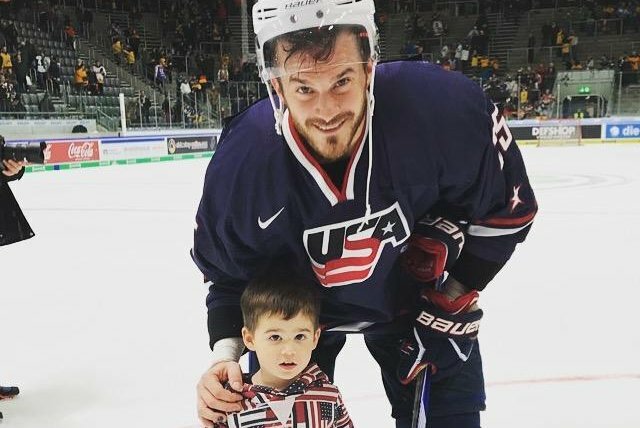 Chad Kolarik dons his Team USA uniform while showing his son around the ice. No one will ever accuse the Philadelphia area as being a hockey hotbed. One look down the 2018 United States Olympic ice hockey team’s roster may challenge that. The Philadelphia area has three players on Team USA, Ryan Gunderson, from Bensalem, Brian O'Neill, from Yardley, and Chad Kolarik, from Abington. All three are living out a dream, after living the nomadic life of a hockey minor leaguer. For Kolarik, a right winger currently playing with the Adler Mannheim Eagles of the Deutsche Eishockey Liga (DEL) in Germany, this chance is something beyond special. One important point is that he’s getting a chance to share the moment with his son, 3½-year-old Christian, and secondly, he’s playing in the memory of USA Hockey general manager Jim Johannson, who died unexpectedly at the age for 53 on Sunday, January 21, and someone Kolarik has known for over 20 years. It was Johannson that gave Kolarik the call that he made the team. “Jim was the one who sent me a text in December to call him,” recalled Kolarik, 32, who played for La Salle College High School his freshman year. “You see that text and you put everything down. I called him back and Jim was excited to tell us that we made the U.S. Olympic hockey team. I think he said that it was one of the best days he had with USA Hockey in 15, 16 years. It means a little more knowing his son his old enough to absorb everything. Even at 3½, Christian is zipping around the ice, which might be from the great genetic he shared from his father, who plays professional hockey, and a mother who is former University of Michigan gymnastics great Kylee Botterman, a nine-time All-American. Kolarik’s parents have relocated from the Abington area out to Wilkes-Barre. Kolarik himself goes back and forth from Germany to Chicago, where his wife Kylee and her family lives. The DEL, the German league Kolarik plays in, will shut down for a month. There are seven players on Kolarik’s Adler Mannheim that play for the German National Team. This is an older U.S. Olympic hockey team, with an average age in the early 30s, which was put together by Johannson, who first met Kolarik when he was 16. Johannson left an indelible mark on U.S. Hockey and his loss was greatly felt. It serves as added motivation for the U.S. team to do well. “Jim was a special guy who cared about you,” Kolarik said, through some emotion. “He cared for me as a player, since I’ve known him for 16 years. His loss really hit everyone associated with USA Hockey pretty hard. I was 16 when Jim selected me for the US National program. That was a special moment for me. We’ve kept in touch through the years. “Jim spoke to you as if he knew you your whole life because that’s how he cared about you and how he talked to you. I think you could call all 25 guys on Team USA and they would say the same exact thing about Jim. He treated you like somebody that was special and gave a lot of respect to the guys. He was always someone who did everything for you. He did everything from taking care of housing, to how my family was treated and taken care of. He did it all. Team USA has a chance to medal, Kolarik said. He feels the Scandinavian countries, Finland and Sweden, may be considered the favorites. But Kolarik stressed this is a talented US Olympic hockey team and he knows the tradition. “I think we’re one of the top five teams in the tournament and we have a chance,” Kolarik said. “This feels a lot like the 1980 team because we’re a team filled with no-namers that no one expects us to do anything. It does mean something to wear the USA on your chest, and everyone feels the same way.